In large bowl, mix flour, sugar, baking powder and salt until blended; set aside. In medium bowl, beat eggs, milk, melted butter, vanilla and 1/2 cup mashed banana with whisk until blended. Stir egg mixture into flour mixture until just blended (batter will be lumpy). Pour into pan. Sprinkle chips on top. Bake 20 to 24 minutes or until golden brown, center is set and toothpick inserted in center comes out clean. Cool on cooling rack 10 minutes. Top with Toppings. If desired, serve with additional maple syrup. 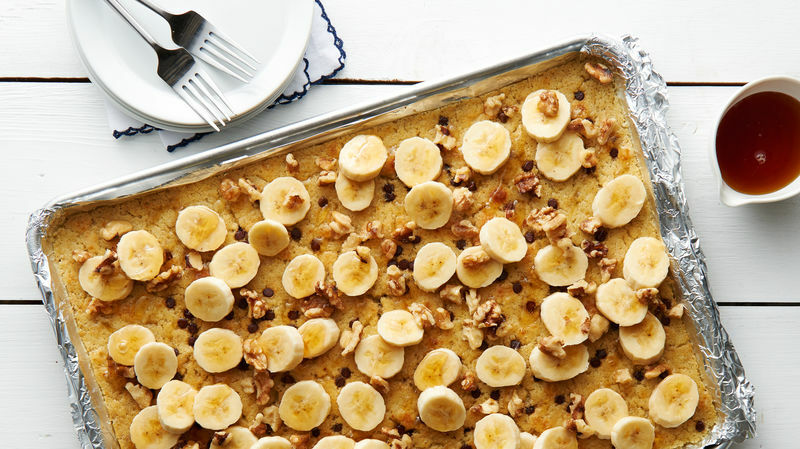 For success in this recipe, different stages of ripeness in bananas works best—firm bananas for slicing, and ripe bananas for mashing.